The Marie Antoinette series of pictorial portraits and The Mirrors will be exhibited together to complement one another. The photographic portraits reveal a rare glimpse into the life of a powerful, very tragic, and often demonized public figure. This demonization was due in no small part to the sexually explicit caricatures and propaganda meant to cripple the monarchy and to provide the public with a scapegoat for their discontent. Based upon historical research, these portraits create a glimpse into the rare private moments of the Queen of France. They are intended as antithesis to the public persona and propaganda that plagued her. While the portraits portray the private, and often painful, undisclosed moments of a powerful woman, Marie Antoinette becomes a symbol of the controversy and contradictions that can exist within the complexity of both women of power and that of women in general. The suffering of women is universal and knows no class barriers or distinction of time or place. The series Mirrors also reflect the intimate life of a woman. The ornate frames and elegant French text are an ironic facade for the subversive messages etched onto the glass—simultaneously a symbol of beauty and tragedy. They reveal the inner world and thoughts that one may have, but may not speak of in polite society. They suggest a hidden world of pain and deep-set anger; some are accusatory, even suggesting taboo topics like child abuse. The inventions of both the mirror and photography have been pivotal in the explosion of portraiture. They have both served to create a sense of self-identity in all who encounter them. The introduction of the mirror into France became a key component of being “civilized” through the ability to make oneself pleasing to others. The French court was one of the first to receive this gift of refinement and civility through bribery to the Venetians, craftsmen of the modern mirror. The fantastic Hall of Mirrors at Versailles was created as a testament of the economic prosperity of France. The mirror was not only instrumental in gifting a sense of self-image, it was also a definitive component in the invention of the camera. With the birth of the camera, the portrait, which was once only available to those wealthy enough to commission a painter (such as the French Royal Court) was then made available to the average person. 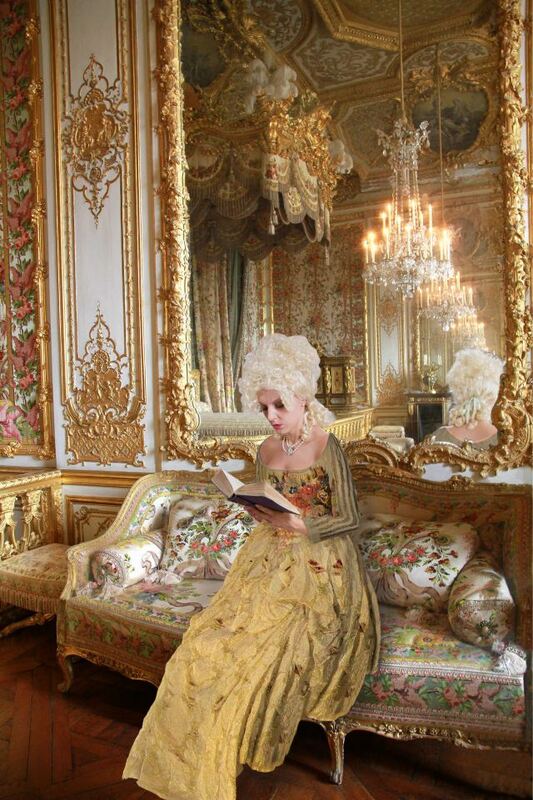 The style of mirrors chosen was one that represents the decadent rococo style of Louis the XIV, which would have adorned the palace walls of Versailles during Marie Antoinette’s reign. Although the series of mirrors began as an attempt to steer new work away from portraiture, their oval shape echoes that of the oval visage of the face. As well, the mirror can be a seen as a portrait of anyone that gazes into its reflection. The portrait is a powerful tool that echoes the self-reflexive nature of humanity throughout time. These works represent complex issues of both feminine experience and of class through the juxtaposition of decadence and tragedy. In particular a key mirror piece in the exhibit reads “Greed is a Social Lubricant,” which literally turns a mirror back on the history of civilized society and any typical art audience. An unexpected portrait of the gilded life is revealed.